This paper focuses on the areas of the interior of present-day Tanzania in the 19th century. The first sections are devoted to the analysis of the characteristics that can be considered as peculiar for the understanding of capitalism in the area: the development of trade and urban life, the emergence of a class of wage labourers and the influence of local political authorities on trade. A final section provides an overview of the available evidence on the earliest conversions to Islam in the interior, with special reference to the most important urban centres that developed along the central caravan road, connecting Bagamoyo, on the coast, to lakes Tanganyika and Victoria. The 19th century was a critical point in the development of international capitalism [Inikori 2007].For the African continent this meant the production and commercialization of new export goods as well as the import of new commodities from different parts of the world. On general terms, this put the basis for the integration of local economic activities into international commercial networks and was at the origin of a gradual «commodification» of the regional economies [Glassman 1995, 36]. The consequences that this had on African societies depended on the extent to which previous trade relationships had been established with the international markets, as well as on the types of goods that were exported. Tanzania, Market of Tabora, early 20th century. 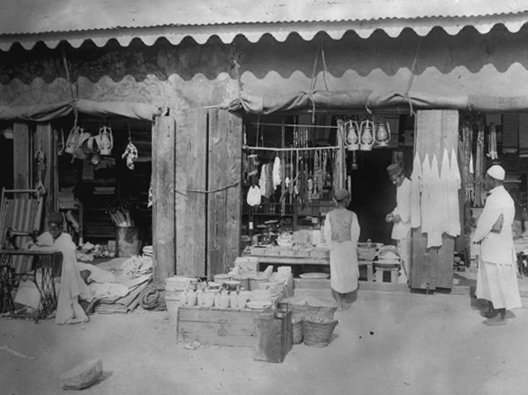 Market of Tabora, early 20th century, Koloniales Bildarchiv, Universitätsbibliothek Frankfurt am Main. This paper focuses on one of the areas of the continent that, owing to the nineteenth-century development of international capitalism, were connected to the coast and the international markets in an unprecedented way: the regions of the interior of what is today Tanzania. The international development of capitalism drove the demand for East African commodities, like ivory, copal and hides, sustained the plantation economy of Zanzibar and Pemba that employed slaves coming from the mainland, and permanently changed the terms of participation of East Africans to the world economy. This process was not an abrupt shift from agriculture and craft production to new, capitalist, modes of production, but rather a complex of gradual economic changes determined by market forces, driven both by international capitalism and by the emergence of local entrepreneurial groups, i.e. Muslim traders, Indian financers and African traders. This article originates from a paper presented in the panel "Religion and Capitalism in Africa", convened by Tekeste Negash at the European African Studies Conference in Uppsala in 2011. When Tekeste first asked me to present a paper, I thought that little room was available for analysing religion and capitalism in the area and for the period I was working on, i.e. Western Tanzania in the nineteenth century. No doubt, Muslim traders settled in this area for the first time in the 1840s, but for a long time the impact of Islam remained limited. Nonetheless, the establishment of Muslim traders in the caravan towns of the interior created hubs of coastal culture that became the basis on which Islam later developed as a major force of change in twentieth-century Tanzania[Austen 1971, 650]. Islam did not develop in the interior only as a consequence of colonization and the use by Europeans of Muslim agents, interpreters, clerks, etc. It was a much more complex process that originated in the nineteenth century and was related to the involvement of the area in the global economy. This paper focuses therefore on the connection that was established in the nineteenth century between the development of new trade patterns and Islam, thanks to the establishment of Muslim traders in the commercial towns that developed along the caravan roads of the interior. Contrary to the colonial period, when capitalist modes of production developed primarily in the rural areas, nineteenth-century capitalism was more visible in urban centres. In the interior of Tanzania urban centres were established as a consequence of the development of long-distance trade [Burton 2002] and it was in these towns that the changes brought by the new economic patterns were more visible. This makes the study of their political and economic life a lens through which to explore the consequences of the growth of stable commercial relations with the coast in connection with the development of international capitalism, as well as the role of new economic actors in dispersing the seeds of coastal culture, among which is Islam. The first sections of this paper are devoted to the analysis of the characteristics that can be considered as peculiar for the understanding of capitalism in the area: the development of trade and urban life, the emergence of a class of wage labourers and the influence of local political authorities on trade [Iliffe 1979, 19]. A final section provides an overview of the available evidence on the earliest conversions to Islam in the interior, with special reference to the most important urban centres that developed along the central caravan road, connecting Bagamoyo, on the coast, to lakes Tanganyika and Victoria. The Indian ocean is one of the oldest economic and cultural world-systems: thanks to the presence of the monsoon winds, the driving force of the Indian ocean commerce, India and the Arabian peninsula established close commercial relationships with East Africa [Gilbert 2004, 25]. Until the beginning of the nineteenth century, however, the East African coast remained more a part of the commercial world of the Western Indian Ocean than of East Africa, being almost completely separated from its interior. The goods exported from East African ports could be easily obtained in the immediate vicinity of the coastal hinterland and there was therefore no need to organize expensive and risky expeditions in the interior to obtain export commodities. At the same time the regions of the interior were characterized by the presence of a widespread network of African local and interregional trades, mainly in salt, iron, copper, foodstuffs and forest products, that was connected only occasionally to the coast [Gray, Birmingham 1970]. Therefore, trade relations existed before the 19th century. But it was only from the first decades of the nineteenth century, owing to the huge expansion in demand for ivory and slaves, that regular commercial relations were established [Sheriff 1987]. East African ivory was more suitable for being carved than West African or Indian ivory and in the nineteenth century it began to be widely used in Europe and America to produce luxury goods, such as carved figures, parts of instruments, combs and billiard balls, that became a symbol for the growing Western middle class [Beachey 1967]. Slaves were another important item of trade. In the eighteenth century slaves were shipped from East Africa to the Middle East and the Mascarene Islands, but this trade flow diminished as a consequence of the Napoleonic wars and the abolitionist movements in Europe [Glassman 1995, 29]. In the nineteenth century the increase in the demand for East African slaves was mainly driven by the expanding plantation economy of Zanzibar and Pemba [Cooper 1977; Sheriff 1987].In the second half of the century, slaves were increasingly captured in Katanga and Manyema – present-day Democratic Republic of Congo – and in present-day southern Tanzania (Deutsch 2007, 4). Until the 1870s Kilwa remained the most important port of shipment for slaves, whereas ivory mainly came from lake Tanganyika and the interlacustrine region and partly from Chagga and Masai countries and was shipped to Zanzibar through Bagamoyo [Smith 1963, 273-274]. Copal was also widely in demand, being used in the United States to produce high-value varnishes for the furniture industry. East African copal was considered the best in the world and was extracted in the forests of the East African coastal hinterland [Sunseri 2007, 202]. During the nineteenth century all of these products experienced growing prices on the international markets. If we take ivory, for example, its price in Zanzibar doubled between 1826 and 1857, and it doubled again in the next thirty years [Sheriff 1987]. Henceforth, it became very convenient for Indian and coastal traders operating on the coast to penetrate into the interior in search for the precious elephant teeth, slaves and gum copal, which they acquired with imported cloth, glass beads and metal wires. The increase in the price of East African commodities coincided with a decrease in the price of import commodities, that, thanks to the mechanization of the production process in America and Europe, could be imported in huge quantities into the East African interior. Glass beads were mainly produced in Venice, whereas cloth came from India, Great Britain and America. The industrial revolution significantly decreased the production costs for cloth in America and Europe and imports of Indian cloth into East Africa gradually diminished, being mainly replaced by unbleached cloth produced in Massachusetts, locally called merikani [Glassman 1995, 56; Prestholdt 2008]. The continuous expansion of trade in the nineteenth century was sustained by the growing prices of East African commodities, especially ivory, on the international market that led to the accumulation of merchant capital on the coast. Thanks to this capital, coastal traders could fit out larger and better financed caravans for the interior [Sheriff 1987, 181]. As already mentioned, commerce in ivory and slaves required more capital than that in salt and iron, which were typical products of African interregional and regional trade. This capital was provided to costal traders by Indian financers, who advanced the resources needed to travel and trade to coastal traders going inland. In exchange they obtained part of the export goods, generally ivory, when the caravan came back from the interior. The connection of the interior of East Africa to the global market in the nineteenth century was with no doubt stimulated by Muslim traders coming from the Swahili coast.However, the development of these new economic patterns was not a one-way-process and East Africans maintained the power to shape their relationships with the outside world, in the framework of a new market economy [Koponen 1988]. The most important group of traders in central Tanzania were the Nyamwezi from the region of Unyamwezi. Before the development of long-distance trade with the coast, Nyamwezi traders had already been the intermediaries of a wide network of interregional trade, where salt, iron, copper, cattle and agricultural products were exchanged. Thanks to these commercial activities they pioneered the caravan road to the coast and records of their presence in the coastal ports are available from 1811 [Roberts 1968; 1970]. Nyamwezi traders were generally members of the local aristocracy who had been able to exploit the opportunities offered by the trade with the coast and had accumulated wealth in export goods, such as ivory, or commodity currencies, especially cloth and beads. This allowed them to finance their own businesses with the coast and, according to many contemporary sources, they maintained a prominent position along the central caravan road at least until the 1870s [Pallaver 2006]. Nyamwezi traders also enjoyed political power, as the local chiefs appointed many of them at the head of local districts, the so-called gunguli. They had the right to take part in the election of the mtemi, the local chief, and this gave them a great influence in the economic and political life of the towns of the interior [Unomah 1970, 5]. Owing to their long tradition in interregional trade, local traders were able to rapidly adapt themselves to the new patterns of trade, whereas Muslim traders became users and modernizers of already existent commercial patterns [Médard 2007, 115]. Africans living in the regions of the interior did not only take part in long-distance commerce as traders, but also as wage labourers. The Nyamwezi, in particular, were the most requested porters and developed specific abilities to carry goods to and from the coast. They were the first class of wage labourers that developed in the area and became the backbone of the long-distance trade with the coast. As Coquery-Vidrovitch and Lovejoy point out, «in societies that were restrained by a low level of technology, necessary work depended to a very great extent on human energy» [Coquery-Vidrovitch, Lovejoy 1985, 9]. Groups of waged workers were not common in pre-colonial Africa, but they developed in some specific historical situations, especially when the request for a particular type of occupation was expanding too fast to be satisfied by other forms of labour. In pre-colonial Africa wage labour was generally limited to certain sectors: transport, exchange and possibly craft production, and, among these, human transport was usually the first form of hired labour [Iliffe 1983, 8]. In nineteenth-century East Africa the development of the trade in ivory, copal and slaves created the conditions for the development of a class of waged workers in the transport sector, human porters. Their role in East African long-distance trade has been deeply investigated [Cummings 1973; Rockel 2006]. Recent research has demonstrated how porters were not slaves, as it had been commonly believed, but rather a group of specialized and skilled workers who received a wage in exchange for their work [Rockel 2006, 19-23]. They developed specific abilities to transport all the goods needed for the maintenance of caravans during their inland journeys and they carried commercial goods back to the coast. As a class of wage labourers, porters acted individually and collectively to defend their common interests. When the wages were not considered appropriate they refused to continue their march until conditions of employment were renegotiated. African porters successfully transported goods across deep-rooted trade networks and played a critical role in creating the conditions for the participation of East Africa to the global economy. As Stephen Rockel has pointed out, «wage long-distance porters created the conditions for the emergence of an African modernity, admittedly one with its own contradictions and severe limitations, in which market forces, entrepreneurship and creative cultural adaptation were free for a period to find their way» [Rockel 2006, 23]. Together with porters other professional figures developed in connection with the caravan trade. The kirangozi was the guide who was in charge of leading the caravan. He possessed a deep knowledge of the best paths to follow in order to find food and water during the journey. Besides ki-swahili, he was skilled in the languages needed for trading in the interior. He was often in charge of the negotiation of tributes, the hongo, that had to be paid to local chiefs along the caravan roads [Beidelman 1982, 618-619]. The nyampara was the head of small gangs of porters, generally composed by ten-fifteen individuals. He recruited his own group of porters in the coastal ports, negotiated their salaries and he was responsible for them during the journey [Burdo 1886, 306]. There were several nyamparas in the same caravan, but only one kirangozi. That is why the kirangozi was also known as chief headman. Armed guards, the askaris, always travelled with a caravan. They had the task to protect the caravan and also to maintain the order in the porter ranks. The number of askaris employed generally depended on the total number of porters; commonly there was one guard to every ten porters. The askaris were for the most part of coastal origin and many of them settled in the commercial towns of the interior. Different types of workers were employed in the caravan trade and all of them received a wage in exchange for their work. This contributed significantly to the expansion of a monetary economy in the regions of the interior. Money, in the form of cloth and beads, became common in the payment of wages and was used to buy food along the caravan roads. The caravan staff received daily food rations, the so-called posho, that could be paid both in grains (generally sorghum or millet) or in exchange goods, especially beads. Having a very small unit value, glass beads were particularly suitable to be used in these small transactions, and porters became the main agents in spreading the use of these means of payment along the caravan roads in the Zanzibar commercial hinterland [Pallaver 2009]. Porterage was a well-rooted occupation especially among the Nyamwezi of Western Tanzania. Before the development of stable trade connections with the coast, the Nyamwezi had been employed as porters in local and interregional trades, carrying iron, salt and copper along the caravan paths that connected Unyamwezi with lake Tanganyika, lake Victoria and the southern regions of Ufipa and Ruemba. Well before the contact with traders coming from the coast, labour specialization had emerged as a result of an unequal distribution of goods [Holmes 1971, 478-479]. In the first part of the nineteenth century the Nyamwezi worked as porters only during the dry season. Porters were, in fact, also farmers, and when the rainy season started they refused to go beyond Unyamwezi and went back to their fields [Deutsch 2006, 24]. The caravans had therefore to stop in Unyamwezi in order to recruit fresh gangs of porters that could reach the shores of the central lakes or the regions of Eastern Congo. The time necessary to find and engage new porters created the need to have small depots where the goods could be stored and protected [Brown, Brown 1976]. Some of these depots, especially those situated in places where food and water were easily obtainable, gradually developed into small settlements and later into commercial towns. Urban development in the interior of Tanzania was strictly related to the growth of long-distance trade and the establishment of coastal traders in places where local political authorities were favourable to trade. In the places where there was a permanent Muslim trading colony, like Ujiji or Tabora, the role of coastal traders was much more clearly defined than along the caravan roads or in the trading areas where they did not settle; that is why the analysis of their commercial and political activities in the urban centres of the interior can provide a more comprehensive picture of their role. Coastal traders did not have the power or influence to dominate local politics in the towns of the interior. They therefore generally cooperated with local political authorities in order to protect and support their business. In the town of Ujiji, for instance, the leader of the resident coastal trading community collaborated with the local chief in ensuring the regular delivery of tributes from caravans. Different issues, like market conflicts and land questions, were dealt with collectively by the representative of the coastal community, the elders and the local chief [Brown 1971, 627]. Personal relationships were established to reinforce commercial collaboration. The leader of the coastal traders community of Ujiji, Mwinyi Heri, married the daughter of the King of Bujiji, acquiring the status of chief and in the 1860s and 1870s he exerted great influence both in Uvira and Ujiji [Sperling 2000, 288-289; Brown 1971, 628]. The same happened in Tabora, where in the 1840s Muhammad bin Juma, a trader from Oman origin living in Tabora, married the daughter of Fundikira, chief of Unyamwezi. After this marriage the Muslim community supported Fundikira and his family in the disputes with his neighbours. Before the establishment of German colonial rule, local political authorities had the power to control trade and therefore the activities of coastal traders. There were two ways by which local rulers could influence trade: by taxation and by not allowing porters to enlist in the caravans. In Tabora, after the death of chief Fundikira in 1859, his successor, Mnywa Sere, levied taxes on the profits made by trade [Speke 1863, 77]. This caused the strong opposition of local coastal and Nyamwezi traders. They declared war against the local chief, supporting one of his brothers, Mkasiwa, to the succession to the throne. Mnywa Sere was defeated and Mkasiwa became the new chief [Bennett 1968, 222]. However, Mnywa Sere continued to fight the traders of Tabora until his death, in 1865, causing great damage to the progress of trade. As a consequence of these rivalries the sultan of Zanzibar appointed a wali, a delegate of his power in the coastal community of Tabora, who had to be the intermediary between the coastal community and the local chief. Despite the appointment of his representative in Tabora – and almost contemporary also in Ujiji –, the influence of the Sultan of Zanzibar on the towns of the interior remained very limited, at least until the 1880s when he intervened to protect European trade interests in the interior [Pallaver 2006, 518; Brown 1971, 628]. The scattered presence of the coastal traders in the interior was one of the reasons behind the limited influence of Islam in the area in this period. On general terms, Islam had a limited impact inland even if we have knowledge of earlier conversions in some of the areas that had developed deep connections with coastal traders [Iliffe 1979, 79]. The most well-known example of nineteenth-century conversions is that of the Yao, who in the second half of the nineteenth century migrated from Mozambique and established in Malawi and southern Tanzania. Yao traders were mainly involved in the slave trade and exported their captives to the coastal port of Kilwa. In this area the development of long-distance trade was at the origin of the development of new towns, that were governed by big trading chiefs. According to Alpers, these chiefs were among the first individuals to be influenced by the religion of the coastal traders, who arrived in the interior at the middle of the century [Alpers 1969, 417]. Two important Yao chiefs, Makanjila III Banali and Mataka II Nyenje, converted to Islam, the former in 1870, the latter in the 1880s and were the pioneers of the great expansion of Islam that started in the 1890s [Alpers 1969, 419]. Few other, isolated cases of conversions are documented in East Africa, like the case of Mumias around Mount Elgon, in the 1880s [Glassman 1995, 69] or the ruler of Ubungu, south-western Tanzania, who was known in the 1850s and 1860s as a «serious Muslim» [Iliffe 1979, 78]. Chiefs connected to Muslim traders and engaged in commerce often sought for new forms of legitimization that put them closer to their Muslim commercial partners. This was true also for the area subject of this study. Isike, chief of Unyanyembe from about 1877 to 1893, was observing Ramadhan in the early 1880s, even if he was probably less committed than other chiefs to Islam [Iliffe 1979, 78]. Nonetheless, in the caravan towns of the interior conversions were very limited. According to Father Mènard, of the White Fathers, in Tabora «The influence of Islam, as far as creed and religious practices, is nowadays barely spread among the Wanyamouesis [Nyamwezi] and even much less among the Watousis [Tutsi], a race who takes care of the cattle. Only the slaves of the Arabs and of the Wangwana are Muslim». He went so far as to say that «the Arabs of Tabora are totally absorbed in trade and they do not care at all about religion […]; fanaticism is not among their defects». If we consider that this note was written in Tabora, the place of the interior with the biggest Muslim community, and put down by a catholic missionary, who at that time naturally feared the competition of Muslims, we can quite confidently assert that the influence of Islam in the area was at the time very limited. As a matter of fact, the number of Africans who adopted Islam was very small, and limited to the entourage of Muslim traders. The largest part was composed by wangwana,  coastal people who were Muslim and spoke ki-swahili, and had generally arrived in the interior together with commercial caravans, and Manyema freed slaves [Iliffe 1979, 214]. The German colonial period saw the spread of Islam in the urban centres, as well as in the countryside, of the interior of German East Africa as well as the first substantial increase in the conversions to Islam by inland people. Recent studies [see for instance Reese 2004] have convincingly shown how Islam did not develop in the interior only as a consequence of colonization and the use by Europeans of Muslim agents, clerks or interpreters [Trimingham 1964; Sperling 2000, 295]. On the contrary, the process had started well before, thanks to the activities of Muslim teachers coming from the coastandby personal adherence to Islam by individuals in contact with inland trading settlements [Iliffe 1979, 214]. Before the German conquest, in the immediate hinterland of Bagamoyo and Dar es Salaam, there was a significant increase in the conversions to Islam, owing to the establishment in the area of Hadhrami Arabs [Glassman 136; Le Guennec-Coppens 1997]. During the nineteenth century the Muslim communities that were established along the caravan roads were mainly interested in trade – and politics, when it was relevant for trade – but not in spreading their religion. This is confirmed by the absence of places of worship in the commercial towns of the interior. European observers who visited Tabora and Ujiji were struck by the total absence of public places of prayer and religious instruction. Nonetheless, the coastal presence in these towns became the nucleus from which the coastal culture expanded in the interior. These towns were crossroads for the spreading of ideas throughout East Africa [Brown, Brown 1976, 198]. Coastal traders spoke ki-swahili, dressed in the coastal way, introduced the use of new commodities and the cultivation of new plants and were Muslim. Elements of the coastal religion were gradually incorporated into local religious practices and culture – like, for instance, healing practices – and were adopted in the interior far more rapidly than the religion itself [Glassman 1995, 134-135]. The pace of this process is for its nature impossible to quantify or clearly identify, but its origins can be traced back to the nineteenth century and the establishment of direct and sustained contacts with coastal traders and the coastal culture. During the 19th century the areas of the interior of Tanzania were connected to the expanding global market. Owing to the presence of coastal traders as well as thanks to the activities of African traders and porters who regularly visited the coast, new forms of accumulation, wealth and exchange developed in the regions of the interior and new imported ideas became gradually part of the daily lives of many Africans. The places where Muslim traders settled were very few when compared to the vast area where they were trading and this partly explains why the Muslim presence had a little religious impact on the local populations, contrary to the economic and political changes generated by the trade connections with the coast. No doubt, the towns that were established along the caravan roads, like Tabora and Ujiji, became outposts from which new ideas expanded and gradually took roots in the interior, not only Islam but also Christianity. The lack of general studies on the spread of Islam in the Zanzibar commercial hinterland in the nineteenth century makes it difficult to provide a general picture of the direct connection between the development of capitalist modes of production and of new religious patterns. As it has been pointed out, the history of Islam in this period necessarily lies hidden behind the secular and commercial activities of coastal traders that are so much better known [Sperling 2000, 288-9]. Alpers E. 1969, Trade, State and Society among the Yao in the Nineteenth Century, «Journal of African History», 10 (3): 405-420. Austen R. 1971, Patterns of Development in Nineteenth-century East Africa, «Journal of African History», 4 (3): 645-657. Beachey R.W. 1967, The East African Ivory Trade in the 19th Century, «Journal of African History», 8 (2): 269-290. Becker F. 2008, Becoming Muslim in Mainland Tanzania, 1890-2000, Oxford: Oxford University Press. Becker J. 1887, La Vie en Afrique en trois ans dans l'Afrique Centrale, 2 voll., Paris: J. Lebègue and C.
Beidelman T.O 1982, The Organization and Maintenance of Caravans by the Church Missionary Society in Tanzania in the19th century, «International Journal of African Historical Studies», 15 (4): 601-623. Bennett N.R. 1968, The Arab Impact, in Ogot B.A., J. A. Kieran J.A. (eds.) 1968, Zamani: A Survey of East African History, Nairobi: East African Publishing House, 216-237. Brown W.T, Brown B. 1976, East African Trade Towns: A Shared Growth, in Arens W. (ed.) 1976, A Century of Change in Eastern Africa, The Hague-Paris: Mouton, 183-200. Brown B. 1971, Muslim Influence on Trade and Politics in Lake Tanganyika Region, «International Journal of African Historical Studies», 4 (3): 617-629. Burdo A.M.L. 1886, Les Belges dans l'Afrique Centrale: voyages, aventures et découvertes d'aprés les documents et journaux des explorateurs, Bruxelles: Maes. Burton A. (ed.) 2002, The Urban Experience in Eastern Africa c. 1750-2000, Nairobi: British Institute in Eastern Africa. Burton R.F. 1859, The Lake Regions of Central Equatorial Africa, «Proceedings of the Royal Geographical Society», 29: 1-454. — 1860, The Lake Regions of Central Africa, 2 voll., London: Longman, Green, Longman and Roberts. Cooper F. 1977, Plantation Slavery on the East Coast of Africa, New Haven: Yale University Press. Coquery-Vidrovitch C., Lovejoy P. (eds.) 1985, Workers of African Trade, Paris, Beverly Hills: Sage. Cummings R. 1973, A Note on the History of Caravan Porters in East Africa, «Kenya Historical Review», 1 (2): 109-138. Deutsch J.G. 2006, Emancipation without Abolition in German East Africa c. 1884-1914, Oxford: James Currey. — 2007, Notes on the Rise of Slavery and Social Change in Unyamwezi, in Médard H., Doyle S. (eds.) 2007, Slavery in the Great Lakes Region of East Africa, Oxford: James Currey, 111-123. Freitag U., Clarence-Smith W.G. (eds.) 1997, Hadhrami Traders, Scholars and Statesmen in the Indian Ocean, 1750s-1960s, Leiden: Brill. Gilbert E. 2004, Dhows and the Colonial Economy of Zanzibar, 1860-1970, Oxford: James Currey. Glassman J. 1995, Feasts and Riot: Revelry, rebellion and Popular Consciousness on the Swahili Coast 1856-1888, London: James Currey. Gray R., Birmingham D. (eds.) 1970, Pre-colonial African Trade: Essays on Trade in Central and Eastern Africa before 1900, London: Oxford University Press. Holmes C.F. 1971, Zanzibari influence at the Southern end of Lake Victoria: the Lake Route, «International Journal of African Historical Studies», 4 (3): 477-503. Iliffe J. 1979, A Modern History of Tanganyika, Cambridge: Cambridge University Press. —1983, The Emergence of African Capitalism, London: Macmillan. Inikori J. 2007, Africa and the Globalization Process: Western Africa, 1450-1850, «Journal of Global History», 2 (1), 63-86. Koponen J. (1988), People and Production in late Pre-colonial Tanzania. History and Structures, Helsinki: Finnish Society of Development Studies. Le Guennec -Coppens F. 1997, Changing Patterns of Hadhrami Migration and Social Integration in East Africa, in Freitag U., Clarence-Smith W.G. (eds.) 1997, Hadhrami Traders, Scholars and Statesmen in the Indian Ocean, 1750s-1960s, Leiden: Brill. Livingstone D. 1874, The Last Journals of David livingstone in Central Africa from 1875 to his Death, London: Murray. McDow T.F. 2005, Being Baysar: (In)flexible Identities in East Africa, «The MIT Electronic Journal of Middle East Studies», 5, 34-42. Médard H. 2007, Le Rouyame du Buganda au XIXe siècle: mutations politiques et religieuses d'un ancien état de l'Afrique, Paris: Khartala. Middleton J. 1992, The World of the Swahili: an African Mercantile Civilization, New York-London: Yale University Press. Pallaver K. 2006, Nyamwezi Participation in Nineteenth-century East African Trade. Some Evidence from Missionary Sources, «Africa», 61 (3-4): 513-531. — 2009, 'A Recognized Currency in Beads': Glass Beads as Money in 19th-century East Africa: the Central Caravan Road, in Eagleton C., Fuller H., Perkins J. (eds.) 2009, Money in Africa, London: British Museum, 20-29. Parkin D., Headley S.C. 2000, Islamic Prayer across the Indian Ocean: inside and outside the Mosque, Richmond: Curzon. Pouwels R.L. 1987, Horn and Crescent. Cultural Change and Traditional Islam on the East African Coast, 800-1900, Cambridge: Cambridge University Press. — (eds.) 2000, The History of Islam in Africa, Oxford: James Currey, 273-302. Prestholdt J. 2008, Domesticating the World. African Consumerism and the Genealogies of Globalization, Berkeley and Los Angeles: University of California Press. Reese S.S. (ed.) 2004, The Transmission of Learning in Islamic Africa, Leiden, Boston: Brill. Roberts A.D. 1968, The Nyamwezi, in Roberts A.D. (ed.) 1968, Tanzania before 1900: Seven Area Histories, Nairobi: East African Publishing House, 117-150. — 1970, Nyamwezi Trade, in Gray R., Birmingham D. (eds.) 1970, Pre-colonial African Trade: Essays on Trade in Central and Eastern Africa before 1900, London: Oxford University Press: 39-74. Rockel S. 2006, Carriers of Culture. Labor on the Road in Nineteenth-century East Africa, Portsmouth: Heinemann. Rollingher L. 2005, Constructing Islam and Swahili Identity: Historiography and Theory, «The MIT Electronic Journal of Middle East Studies», 5: 9-20. Sheriff A. 1987, Slaves, Spices and Ivory in Zanzibar. Integration of an East African Commercial Empire into the World Economy, 1700-1873, London: James Currey. Simpson E., Kresse K. 2008, Struggling with History: Islam and Cosmopolitanism in the Western Indian Ocean, New York: Columbia University Press. Smith A. 1963, The Southern Section of the Interior 1840-1884, in Oliver R., Matthew G. (eds.) 1963, History of East Africa, Oxford: Clarendon Press, (1): 253-296. Speke J.H. 1863, Journal of the Discovery of the Source of the Nile, London: Blackwood and Sons. Sperling D.C. 2000, The Coastal Hinterland and Interior of East Africa, in Levtzion N., Pouwels R.L. (eds.) 2000, The History of Islam in Africa, Oxford: James Currey, 273-302. Sunseri T. 2007, The Political Ecology of the Copal Trade in the Tanzanian Coastal Hinterland, c. 1820-1850, «Journal of African History», 48: 201-220. Trimingham J.S. 1964, Islam in East Africa, Oxford: Clarendon Press. Unomah A.C. 1970, Vbandevba and Political Change in a Nyamwezi Kingdom Unyanyembe during 1840 to 1890, Paper presented at the Universities of East Africa Social Science Conference, Dar es Salaam, 27-31 December. For a useful recent overview on the available literature on the expansion of Islam in Tanzania, see Rollingher 2005, 9-12; for a discussion on the forms of Islam that spread in the coastal hinterland, see Glassman 1995, 137-145. Père Livinhac, Sainte Marie près de Roubaga, 9/9/1879, White Fathers Archive, Rome (hereafter WF) C 11-12. Père Charmetant, Notes à consulter sur l'organization et la marche de la caravane, 1878 WF C 11-2. Journal de Père Deniaud, 03/12/1879, WF C 11-18; P. Combarieu to Maison Mère, Tabora, 27/12/1879, WF C 14-282. L. Henri, Notes sur Tabora(particulierment sur les Arabes) 1924-25, manuscript, WF. Lt. Hermann, Tabora, 2/4/1892, Reichskolonialamt, Berlin, 1001/1030-6381. Père Hauttecoeur, Tabora, 25/12/1882, WF C 20-104.; my translation. Mgr Bridoux, Mpala, 9/6/1889, WF C 16-179. P. Guillet to MM, Tabora, 20/08/1881, WF C 16-73; my translation. P. Mènard, Tabora, 25/12/1882, WF C 20-103, my translation. In the towns of the interior the wangwana conducted small commercial activities; among them there were Baluchi men coming from Makran and Oman [McDow 2005]; for a definition of wangwana, see Glassman 1995, 62. For a recent study on the subject with a focus on South-eastern Tanzania, see Becker 2008.